Seems like Goodwill and grocery shopping go hand in hand for me. I always have to stop by and see what's new, and especially when it is 25% off Senior day. On my last trip I found quite a few treasures. 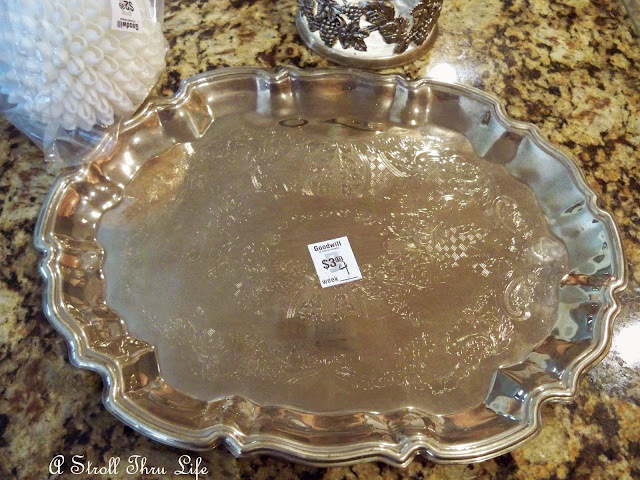 Still finding gorgeous trays and for $3.99 less the 25%, I had to have this one. See how pretty it is all cleaned up. Big enough to hold a vignette also. I am still trying to buy one Christmas gift a month so when the holiday rolls around I will be way ahead of the game. 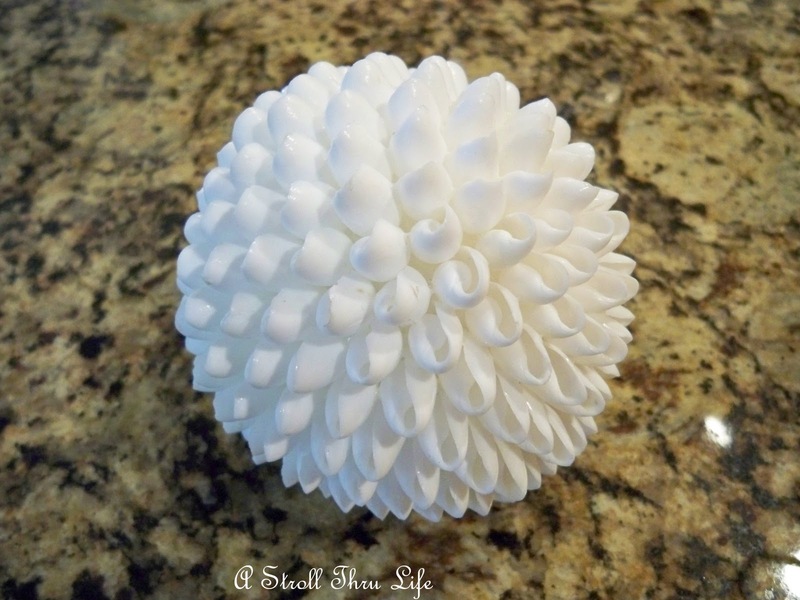 This beautiful shell orb is perfect for someone on my gift list. So pretty. I love it when I see the perfect treasure to fill the voids in my silver collection. I didin't have a candelabra, and this one is nice and big, and really heavy. Also I can always use another silver wine glass. They are such fun to decorate with. 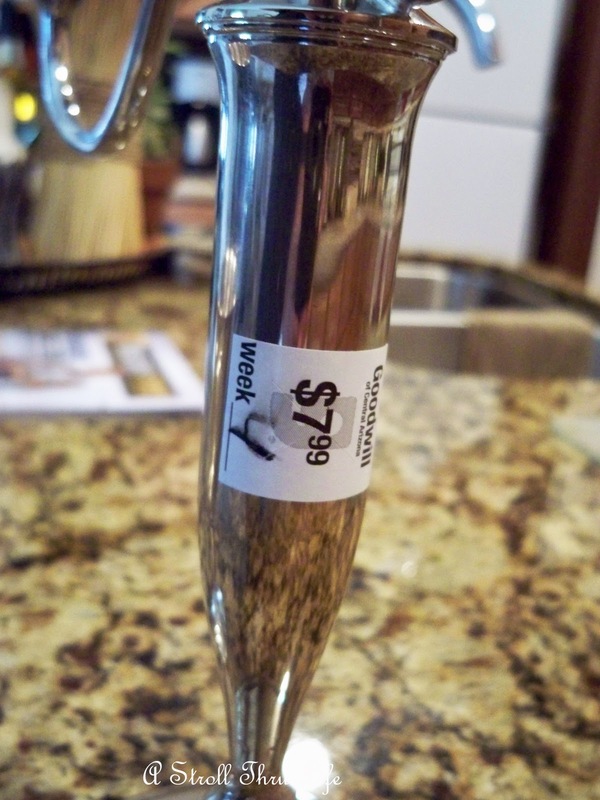 The wine stem was only $1.99, and it gleams with just a little polish. Look at the price on the candelabra, and with 25% off, can't beat that. In yesterday's post I showed you my wine coaster with bottle stopper holder that I found on this same trip. Love it when I find an unusual piece. So fun to play with new treasures. Now I need to create something new with the rest of my finds. Come back for Table Top Tuesday, I have big plans for some more of my silver. Love all your great finds Marty. Your silver pieces are so shiny and pretty!! You did really well! Woo Hooness, Marty! Wow, does your GW ever have wonderful things! And those prices! Beautiful silver pieces and II think you're really smart buying Christmas gifts early. I need to do that, but always wait till almost Christmas! Marty! You lucky girl!!! I LOVE silver! And the ones you got are just unbelievable! The candelabra I would have snatched up in a second!! And the tray!!! And the wine holder! Well and on top of all that your vignette is just adorable! LOVE IT! I think I am coveting that candleabra!! COVETING! 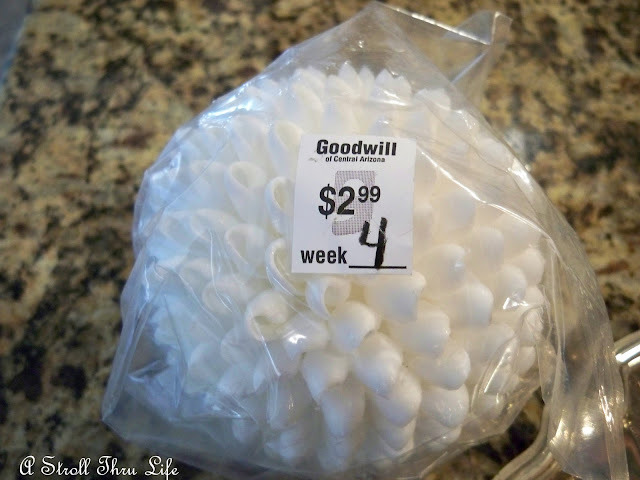 What a great idea to start Christmas shopping now and doing it at Goodwill. I really have to take time to go there and the Salvation Army too more often. We have both here. You're killing me with all the silver. I'm getting silver envy here. Our Goodwill is not coming through for me, but I'm not giving up. It has to look up soon. You have the best Goodwill. I love all the silver you have found. What great finds. You are a lucky lady. We never have silver at our Goodwills. Love all your silver finds especially the goblet. Your vignette with the chef is so cute too! I love it! I just got one at Salvation Army too. I just blogged about it! Great minds!! No way!! you did much better than me this week. When does that senior discount kick in? So pretty Marty!! Which goodwill do you go to? 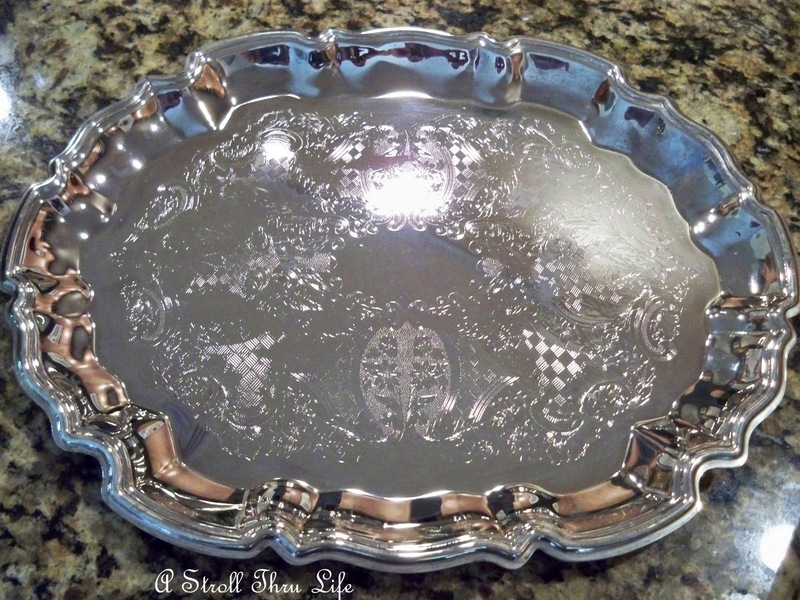 Gorgeous silver tray. What a score with all of the lovely silver pieces, once again you have amazed me with your finds. I really want the silver tray and candelabra! You beat me to it!! I'm always amazed at how many silver pieces I find at thrift shops at good prices. I really love that candelabra, so elegant. You have found some wonderful deals! Thank you for the encouraging comments on my blog regarding the remodel. Marty, you have really scored some wonderful pieces. Great job! I wish the Goodwill in our area had such great stuff; it would be worth the trip if I could find such beauties as you do. I enjoy seeing what you find. You have to have one of the best GW's in the US! You find some of the best treasures and great prices. If you like toile, stop by as I am having a giveaway. My Goodwill NEVER has wonderful things like this. Marty, so much fun.I love Goodwill and Salvation Army,I think it's one of the most relaxing things to do,All by myself.I do love it. Oh Marty ,I'm so impressed that you give some of your finds as gifts.I wish I would do that,I just worry too much about what they would think if they knew.I need to be more like you. Great finds! I didn't notice the wine stopper last time I looked at the wine coaster.....That is such a cool piece. I love the candelabra..I was looking for one last Halloween and never found one. I have to start my search again soon. Girl, I would love to go shoppin with you!!! You find the best things and all at great prices. I can't believe how shiny the tray is now. Looks beautiful. I heart silver! nice finds. One day I hope to find some silver goblets. You have the best luck at Good Will. I went today at lunch, but did not buy anything. They had a little bowl I liked and a couple of cook books, but I talked myself out of them and came out empty handed. Congratulations of your great bargain finds! That candelabra looks much like my heirloom from my MoMa! Beautiful! Keep up the great bargain hunting and we'll keep applauding!Thanks for sharing! You did super and I wish it had been me! Wow! Such great finds! (Not fair, though. We don't have anything like these treasures at my goodwill) Your vignette is just beautiful. Love it and the gorgeous kitchen in the background. OMG, Marty, you must be walking on air right now! All that silver for so cheap? It is all lovely. I think I had better hit our St. Vinnies a bit more often. We have a GW in Bend, but I never go there because it is really expensive. I used to love the ones in Eugene and Springfield though. Great finds for great prices, I always enjoy that when it happens! Look at all this beautiful THRIFTY silver...I'm telling you...I so need to stay out of GW and thrift stores...they are breaking my bank...I have found sooooo many deals there the past few weeks. Marty! You have a knack for hunting down treasures. I love the coaster with the tine stopper holder. I've never seen anything like that...so cool! Marty, you are finding the best silver pieces and at GW. You are one lucky lady. You are amazing. Such wonderful finds, pulled together with such flare! GW(s)don't have prices that reasonable! Great find Marty! Silver and shells are right up my alley. I have 2 of the shell balls and I love them. 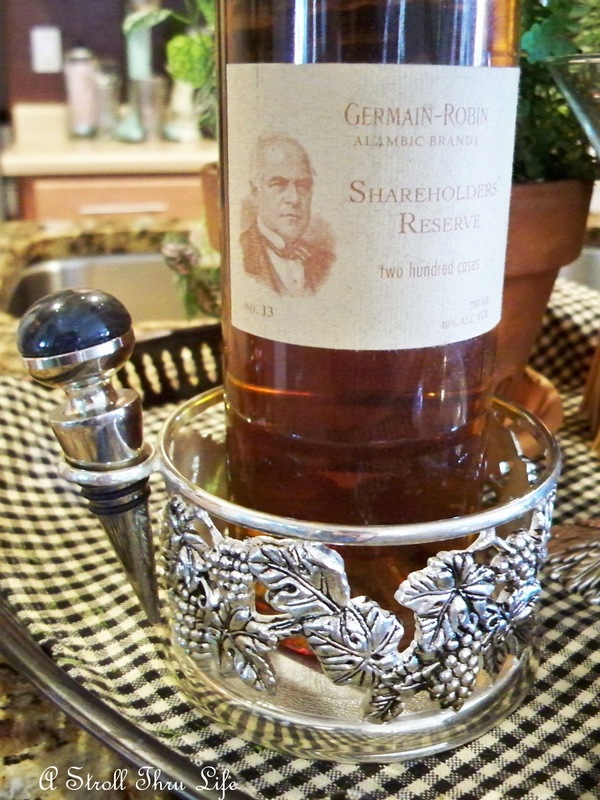 I have one in a silver compote. I am sure GW knows when you are coming (without a friend) and runs and puts all their prettiest silver on the shelves so you will pick it up and give it a good home! Oooh...you certainly did haul off the loot this week, my friend! I'm loving all of that beautiful silver! I'm so happy for you...and sooo green with envy all at the same time! Hehe! 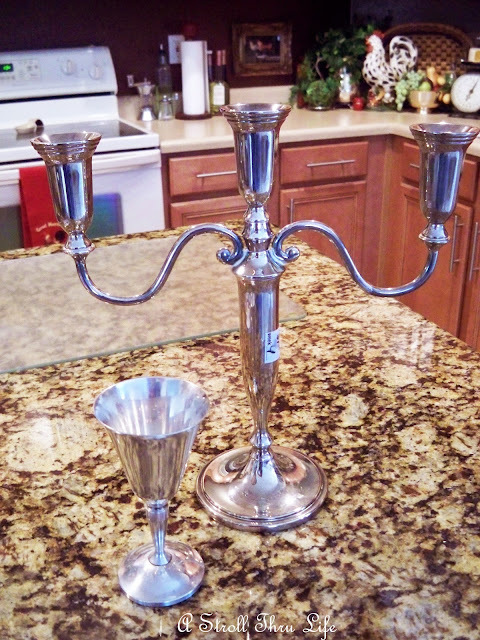 The tray is gorgeous and the silver candelabra...ohhh my goodness...you got such a great deal on that pretty piece! Oh and the shell orb...is sooo pretty! Love that! Thanks for sharing all of your newest treasure finds, sweet friend! Can't wait to see how you use them for TTT! So happy that you stopped by to take a peek at my silver tablescape! You always leave the sweetest notes and make my heart smile! Thank you, sweet lady! These are just fabulous finds!!!! Oh, WONDERFUL!!!! If only I had a smidge of your luck at the thrift store! Amazing finds! You've made them look so wonderful! Wonderful finds Marty! Is it just me or does your heart just soar when you get a tarnish platter like your first one and then clean and polish it up and it instantly becomes this stunning sparkling beauty!Love it! Oh Marty, what beautiful silver finds! I need to make a trip to Good Will. Can't wait to see the vignette you create with your new finds. I was there yesterday and I saw a tray with handles and I hesitated and then walked out without it....hmmm. After seeing your pretty set up on your tray I should go back and see if it is still there! You are so lucky! Your Goodwill store is fabulous. Ours is not so hot. Would you do some silver shopping for me? One thing I do is stocking stuffer shop throughout the year. I look for 4 stuffers and 2 elf presents each month. It sure saves on the hustle bustle of the holidays. Keep your resolve of a present each month! you know I have some MAJOR Silver Envy right now!!!!!!!!!! Boy Marty you sure did hit it right this week. I was at SA yesterday and all I got was two napkins. I'm bummed, I need to come junkin with you. You always get such great silver at GW! What amazing finds. These are classic and should last for quite some time. I love silver trays. In fact, I seem to be starting a collection of my very own =) Have a great day Marty! Marty, you're going to bring silver back so big we'll all be scrambling to find it. I love the tray with the ruffled edge. Do you think silver could possibly increase in value and go the way of gold? I wouldn't doubt it. I'm going to order my Tarn-X off Amazon. That's a complete bargain for the candlabra. I can hardly believe my eyes! Marty, I can't believe you manage to find such wonderful things! I never find anything when I go to the thrift shop but junk. And not the good kind of junk! I love all your treasures, I love the good will store in Ohio where I live. In Fl. for two months and I am going through good will with draw. Help! What gorgeous finds! I adore the shape of the tray you found and the coaster is so cute. Marty, Your treasures are wonderful!! Marty you always find the best silver and for such great prices! 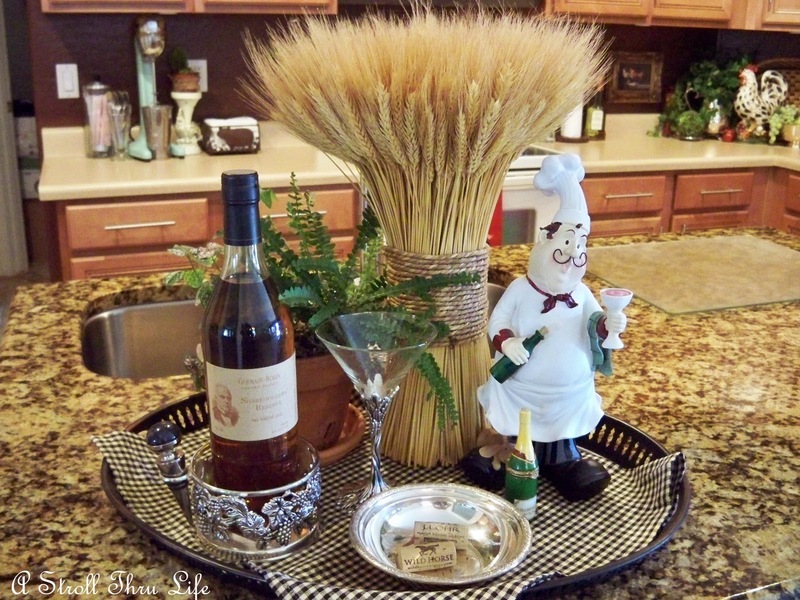 I love the wine tray and stopper! Sheesh!! I never find these kind of deals at my GW! Wow...just gorgeous! The price on the candelabra is perfect! Can't wait to see where you display it! Hugs! That's a great tray, and I love the wine cork and tray. You made off with a good haul! Great finds. I love all of your silver. I haven't found much at our GW lately but I keep stopping by... you never know when you will find a treasure. girl, you made out good. It is so fun to shop at Goodwill. You found them again, Great Finds, that is! Love all the silver you are amassing at awesome prices. The tray and candelabra are stunning. Our GW silver trays run around $6 and I keep stopping by looking for a sale. I need a few more!! Everything looks great and I like how you displayed them! You definitely have the gift Marty! All of your finds are fantastic and I especially love the shell orb. How unique! Thank you so much for linking up to the party this week! I live in Phoenix and usually go to the half price Saturday sales. I always find awesome stuff! I also live close to the 51st Ave & Van Buren clearance warehouse. You should go there sometime.